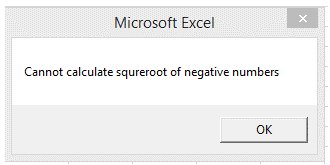 "On Error" Statement is used to handle errors in Excel VBA. 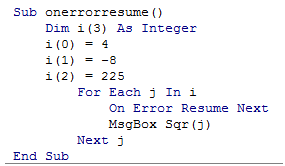 The first case uses "On Error Resume Next" and the second one use "On Error Goto "
l1: MsgBox "Cannot calculate squareroot of negative numbers"
Whereas the second example, the execution is shifted to the line labled as "l1" when an error occurs. Note that the statements "Resume Next" and "Exit Sub" are must in this syntax. 1) How can I get the count of number of series in a Chart using VBA? 3) Is there a way I can average a range of numbers even if there is an error value in range? 8) How can I avoid updates to cell values during macro execution? 9) How can I get users to select a file for processing using my macro?